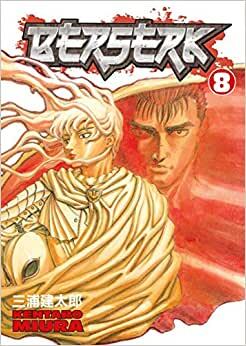 Start reading Berserk Volume 8 on your Kindle in under a minute. 4.0 out of 5 starsIt was as advertised. The price wasn't half bad, the edge of the pages were yellow enough that it should have been included the description, but oh well. The pages themselves a very good condition though. A quick flip through the pages showed that the pages are in very, very good conditions on the inside. There is a tiny, very minuscule cover tear on the very bottom. It is bent back a bit on the top right corner. It was listed as Good to Very good. It's condition is in between good and very good, but more good then very good on the outside, very good on the inside. Overall not too bad, just a bit more external wear then expected. Berserk is probably my favorite Japanese-imported fantasy series. Set in the feudal era where destiny seemed so ingrained, one man bravely swung his sword to ensure his own freedom. Guts is the one man with enough power and determination to challenge the transcendental entities, the Godhand, that impose their sordid sick will on humanity. Never have I so desperately cheered on a protagonist as he took on insurmountable odds with the careless, berserking rage that carried the weight of an entire era. In vol. 8, a Guts much reformed by the heat of battle again challenges Griffith, this time for his freedom from the Hawks. Despite the successes of the Hawks and Griffith's seemingly unstoppable campaign to the Midland throne, Guts wants to swing his sword freely. The life of a mercernary is all he has ever known. Life as a noble simply could not fulfill his own dreams and sense of purpose. Also, Guts can no longer stand being the subordinate of Griffith, Guts battles to claim equality with Griffith, the man ordained by the Behelit (The Egg of the one who would be king). In a discussion with his closest companion Judeau, he realizes that he must become his own man. Judeau, seeing that he might attain this dream, does not attempt to convince him to stay. However, Judeau does warn Guts that Caska, the woman he respects and probably loves, would not leave the Hawks. Guts revealed that in her eyes, he cannot compare with Griffith. However, if he were to make a name for himself, maybe she would look his way. Either way, it is time for Guts to leave the Hawks. "Berserk" is the proof positive that the comic book is one of the greatest products of the arts, combining two mediums: drawing and storytelling. I await the next volume with great anticipation, and even more so the one after that in which Guts pursues the demonized Griffith. If you like anime or manga, do not pass this by! Introduces something I'd been hyped for. Pretty good.